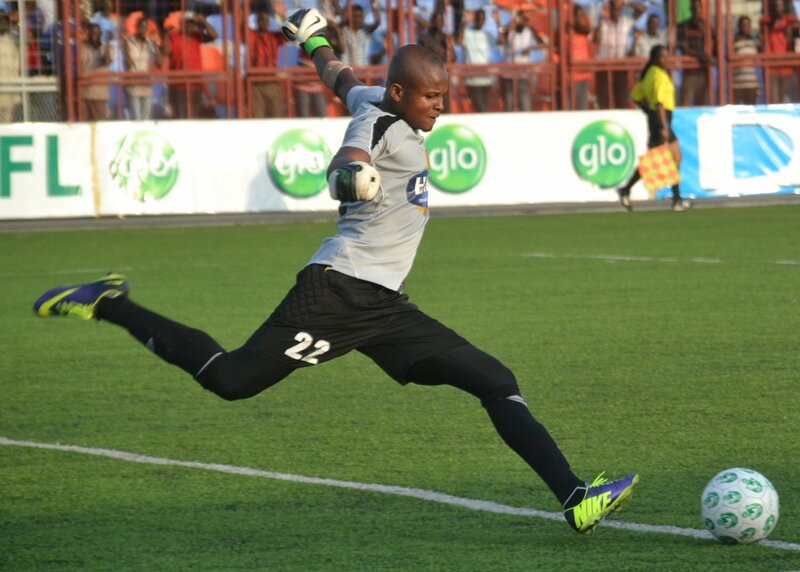 The Top Five Goalkeepers Of Nigeria Professional Football League (NPFL) In 2015. You should see.. In the sense of promoting our Nigerian things, this article was culled from Goal.com article by Samuel Ahmadu to show our dear readers. We are sure most of you don’t watch the Nigeria football league, well,we tend to tell you the NPFL is quite a show right now, ask your friends who watch them, the league is growing bigger and getting more interesting every season. So in case you may not be following the NPFL, We bring to you the five Gollies who has performed so well this season, you should see them. After his move to Sunshine Stars from Sharks, Ezenwa has brought incredible goalkeeping experience to the Owena Waves this season. He has showed great confidence and leadership quality in the backline, and has caught the imagination with a series of dramatic displays. The 26-year-old commands his area with a lot of authority and has also cut out the errors which cost Sunshine in the second stanza after some horrible shows, including a home loss to Nasarawa United. The 2008 Olympics silver medal winner has stepped up to become one of the best emerging domestic goalkeepers. Although his side has conceded 10 goals at home – the eighth-least number of goals conceded by any side this season – he has impressively allowed only 21 goals on the road, earning his side 10 points in the process. Ezenwa also boasts of 12 clean sheets this season. Super Eagles and is a big reason why Kennedy Boboye’s men are still in title contention. The chioce of Paul could be widely debated and raise plenty of questions, but is not far-fetched as his inclusion was not merely to make up the numbers. The Wikki Tourists goalkeeper has brought his experience to bear at every opportunity since replacing injured first-chioce Haliru Sani. Since moving from Enyimba, Paul has had to prove his mettle. He is very sharp with routine saves and has ensured his side have conceded as little as possible even on their worst days. He was most impressive against his former club in Aba when they threw everything at him, he had some terrific stops to keep the swelling scoreline just at 2-0. Aside from the defensive brilliance of Wikki, Paul’s performances have kept the recently promoted side in the run-in for the NPFL title. He has been instrumental in Wikki’s 13 clean sheets this season, the third-least conceding side on 29 behind Enyimba and Warri Wolves, who are both tied on 26. If there is a face that has turned Enyimba into overwhelming favourites for this season’s league title, it is no other than Femi Thomas for his superb shot-stopping and great calm and authority in goal. Thomas has made a massive contribution to the Peoples Elephant’s title bid. The former Akwa United goalkeeper, who started at Zamfara United before moving to Nasarawa United and then Ocean Boys, has seen his belief increase this term. His capture of the starting position at Enyimba is unconnected to his impressive outing as a former junior international. It is hard to fault his performance, even if he is protected by some of the most organized and energetic defenders in the league, his exploits between the sticks have so far kept coach Kadiri Ikhana’s men at the summit. The former Nigeria U20 star gets huge credit for 14 clean sheets so far – more than any other this season – helping Enyimba rake in 16 massive points on the road with no home defeats. Crowning up his great showing this season, the Enyimba custodian has earned himself a deserving invitation to the Super Eagles and a place in the CHAN squad. The Seasiders couldn’t have been better rewarded for holding onto Odah, despite the flashy offers that came their way. The club stood firm and insisted they ‘won’t sell him even for a fee of 100 million Naira’. Following the depature of first-choice goalkeeper Daniel Apkeyi to South Africa’s Chippa United, Odah’s return was a huge bargain for Paul Aigbogun’s men. In the current campaign, Odah has so far showed erratic goalkeeping and performances as well as displaying some of the best shot stopping in the division. While he is surrounded by top defenders, the former Sharks goalkeeper has managed to excel and boasts a long reach and superb reflexes. His ability to keep strikers at bay when his team is firmly under pressure has been massive in Wolves picking 11 points on the road including eight draws and 13 clean sheets so far. After a brief and tiring first stanza at Sunshine Stars under Kennedy Boboye, Isah, who joined from Sharks this season, moved to Shooting Stars for the second part of the campaign. Isah’s big and muscular build gives him physical presence to dominate the goal area. The former Lobi Stars man won the 2012 Federation Cup with Heartland before he was snatched by Sharks in 2013. No doubt, the Nigeria beach soccer goalkeeper, who has made no secret of his huge respect for coach Gbenga Ogunbote, wasted no time teaming up with the Oluyole Warriors when the manager left Port Harcourt this season. Since joining the Ibadan-based outfit, the 24-year-old has brought stalibity to the backline. His performance in the second half of the campaign has seen his side record the least-conceded amount of goals among teams outside the top four with 33, while up picking more points on the road. Aside his class and extreme concentration, Isah’s agility and breathtaking prowess have been invaluable assets for the Ibadan team – evident in his 12 clean sheets so far.